The staff at AGM Services and Junair Spraybooths Ltd would like to congratulate Sales Director Wesley Young for taking part in – and completing – a 78 mile run from Sheffield to Liverpool. In his role as AGM Services’ Sales Director, Wesley is certainly no stranger to travelling the country and meeting new clients to negotiate their spray booth Maintenance Contracts, but his most recent endeavour took him out of the office and onto the roads to show his support for this great cause. 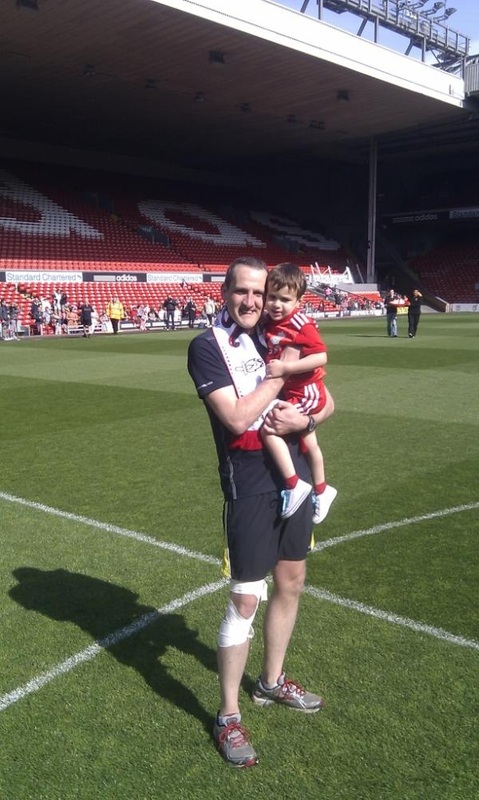 Starting on the pitch at Hillsborough Stadium, Wesley and five other runners took on the huge task of running the 78 mile journey to the pitch at Anfield, in just three days, raising money along the way for the families of those affected by the Hillsborough Disaster. As a lifelong Liverpool fan and keen runner, Wesley expressed more than enthusiasm for the task, saying that “To be able to help raise money and awareness to a cause that has been personally very close to me was a privilege. And despite being the hardest physical task I’ve done, it was a huge amount of fun along the way with a great group of people”. Once again, all the staff at AGM would like to share their congratulations for this wonderful achievement and the contribution that Wesley made to the team effort. Well done Wesley!